The man with the ancient soul. I feel like this week properly became Autumn in Hokkaido. In fact, this week may have actually felt a little more like winter at points. The colours here are stunning just now. The trees are on fire, metaphorically speaking. My body is craving hot tea in even greater quantities than normal. There’s a chill in the air that reminds me I’m definitely English and I definitely need to wear layers. I am, right now, wearing thick socks, winter slippers, and two cardigans. In my living room. I mean, I really, really love autumn here. There’s something amazingly comforting about being tucked up in a cosy house, wrapped up in a warm blanket, wearing knitted socks and knitted jumpers and knitted hats and knitted anything, and being able to consume warm beverages at a rate of pace that means my 3 litre kettle (actually a lot bigger than a UK kettle, what is called a denki-pot in Japanese) struggles to keep up with me. I’ve actually just got home. Today I taught some classes. Had tea/late lunch/carbohydrates with a friend. Talked about starting an NPO here and what that could look like. Called in on next door to check my Obaachan’s were holding up okay… Genuinely the kind of activities that make my heart happy and abundantly thankful. Genuinely the kind of activities that remind me that God isn’t looking for big, He’s looking for faithful. That my everyday-ordinary-yet-so-unordinary-transformed-by-Him-life is a journey of growing in love and faithfulness and sacrifice and holiness and all those inner-world-transformational-truths that we fight for each day. That it’s so-far-from-mundane. That it’s running to God is my weakness and with my regrets and my failures and truly trusting that His mercies are new every-single-morning. I was singing a song earlier called ‘Brokenness Aside’ by All Sons and Daughters (honestly, one of my favourite bands), and the lyrics to this particular, beautiful melody always pierce me. ‘Cause all I know, is how to run. Caught up in words, tangled in lies. And make it beautiful, beautiful. Will You call me child, when I tell You lies? ‘Cause all I know, is how to cry. You make it beautiful, You make it beautiful. Isn’t that some stunning truth? When we’re real in all our gritty realness? When the coolness of Autumn and the memories of our failings wrap around our hearts and we need to blanket of Holy Spirit to melt us from the inside out and remind us that He really does catch us in all our messy weakness. If you hadn’t guessed by my love of photos, I’m an Instagrammer. And Misty Edwards, another of my favourite worship leaders, captured some words to one of the songs for her new album a couple of days ago on one of her Instagram post… I also love these lyrics. And it again takes me back to the reason for the heartrending display of worship we find in Luke 7. And as I revisit this story whenever my heart begins to burn to display the same heartrending display of worship, I’m just going to retell it as I have done before, and probably will do again. In Luke 7, we are told this incredible story. It’s shocking really. Shocking to the core. It’s where Jesus is anointed by a sinful woman. She is not a reputable character. She is the subject of town gossip, and household rumours and brazen-late-night-stories. Everyone knows her for all the wrong reasons. And the thing is, it’s all true. Every word. And she comes to Jesus, who’s at the house of a nobleman in the town, and (who knows how she even got in through the door) she kneels down in front of a room full of people who thought she was so worthless, and, avoiding their gasps and critical gazes, she falls on her knees and she pours this perfume on the feet of Jesus. Perfume of such high worth that it would have probably cost her everything. Everything. So she is crying, and weeping, and filling the house with the fragrance of this perfume and the sound of her tears… And Simon, who owns the house is outraged. He is sitting there watching this scene in such offence. Because he is a righteous man, and he has invited Jesus to his house, and surely if Jesus had any sense or prophetic insight, he would know that this women was a harlot, devoted to sin and destined for hell, and he can’t figure out why Jesus doesn’t just send her and her perfume back to the streets where they belong. Because why would God want someone like that? And if Jesus were really God, why would he even let this sinner touch him? But Jesus, who as God, not only knew the depth of this woman’s sin, but the detail of Simon’s thoughts, speaks in her defence. ‘A certain lender of money had two debtors: one owed him five hundred denarii and the other fifty. When they had no means of paying, he freely forgave them both. Now which will love him more?’ You can almost hear the silence that screams as time stands still, and the reality of what Jesus is saying sinks in. All have a debt they cannot pay. All. But they who really see their need for forgiveness, who run to Jesus with the hole in their life and throw themselves at His feet, pouring out everything in complete abandon. They love much, because they are forgiven much. I love much because I am forgiven much. Oh Jesus, thank you for loving me, even in my mess. In freedom from all the distresses experienced as a result of sin. He doesn’t just forgive her sin. He redeems her future. What kind of love is that? What kind of mercy? What kind of grace? 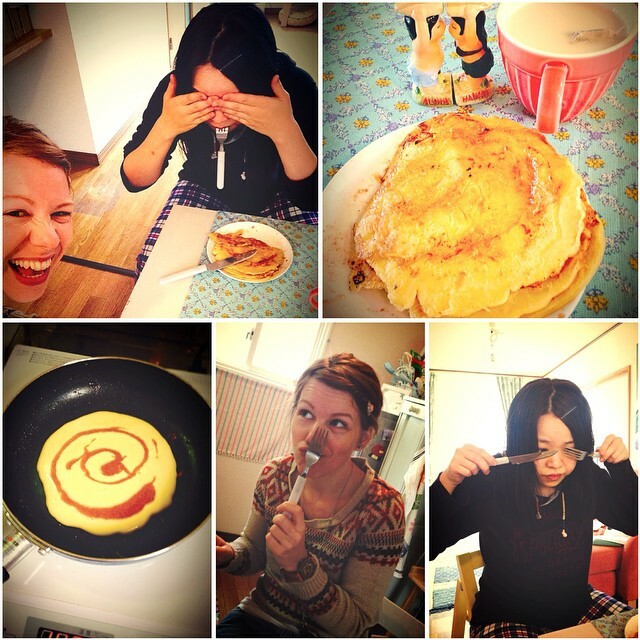 And on that note, enjoy a photo of me and my wonderful friend Ayumi enjoying delicious cinnamon swirl pancakes on our Thursday study-geek-fest morning. And be blessed please. Because we have a faithful Father. Thank for this Peta. I love your posts as they always remind me to be grateful. Jason Gray does a meet and greet after the concert Im about to walk into. Will tell him to check out your writing! NPO??? …….. National Pixie Orchestra ? ← If you want to be inconspicuous, do not wear teenage-mutant-ninja-turtle-pyjamas outside. Obviously.